Hand-made in Santiago, Dominican Republic,Wrapper: Connecticut,Binder: Dominican Republic,Filler: Dominican Republic,All cigars are wrapped in cellophane. 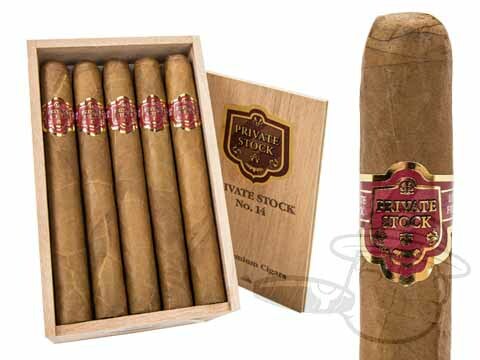 I have been smoking Private Stock 14 for about 4 or 5 years, and they are the perfect cigar for me. They have great flavor, and they are mild just how I like them. Great smoke...very consistent throughout the cigar, nice burn. Great value! These cigars are rolled by rookie Davidoff Cigar rollers with ungraded tobacco. With that said you can't get a better mild cigar for the price! For the price these are one of the best cigars I have tried in years. They are medium/mild, burn smoothly and evenly, and have a great aroma and taste. A steal at Best Cigar Prices! I appreciate the savings and prompt service I receive from your company. This cigar is a great value, smooth even burn,great flavor and a nice mix between mild and medium strength.highly recommend. Is a 94 a better cigar? Yes. Is a 94 three times better? No. At $3 a stick, you can do alot worse and I've yet to smoke better. Extremely smooth and surprisingly complex. Great value. "BestCigarPrices" is friendly, responsive, courteous. I recommend them to my cigar friends. Fabulous smoke at Fabulous price! Over the years they've remained a consistently mild-medium, well balanced, smooth drawing smoking pleasure. Your "Best Prices", coupled with Davidoff's ledgendary perfection and consistency, make me a regular customer. Thank you both for raising the bar high and I trust that you will keep up the good work! Clean, easy to smoke, burns well and smells good too. These cigars are always very consistant. Also the quick delivery was really impressive. Its a mediocre smoke...it is inexpensive and should not expect a quality or taste of a premium smoke. Good to hand out to people who mooch cigars from you. Winston Churchill would have liked these cigars and saved a lot of money. We love this cigar for something that's not expensive but is a smooth smoke. My choice "morning cigar" on the golf course. Private Stock #14 Natural is rated 4.2 out of 5 based on 22 customer ratings.